The DSO Oscilloscope Scopix OX7104 with two galvanic separated channels is an innovative instrument with small dimensions. It is designed for field use or laboratories. Due to the 12 Bit A/D converter and a range of 100 MHz, the small and compact DSO Oscilloscope Scopix OX7104 is an exceptional device. 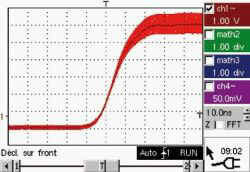 The DSO Oscilloscope Scopix OX7104 can be adjusted by 33 buttons or with the Touchscreen TFT Colour Display. 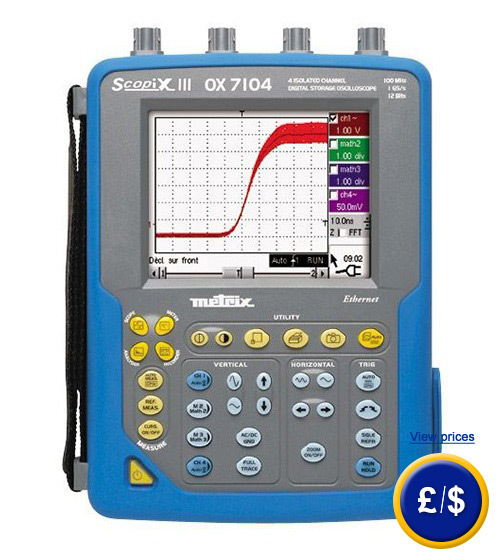 Beside the oscilloscope function the DSO Oscilloscope Scopix OX7104 offers the mode multimeter, harmonic wave analysis (optional), recorder (optional) and performance measurement (optional). Through the network connection Ethernet the DSO Oscilloscope Scopix OX7104 can be operated remotely. If you have any further questions regarding the DSO Oscilloscope Scopix OX7104, take a look at the following technical specifications or contact us: UK customers +44(0) 23 809 870 30 / US customers +1-410-387-7703. 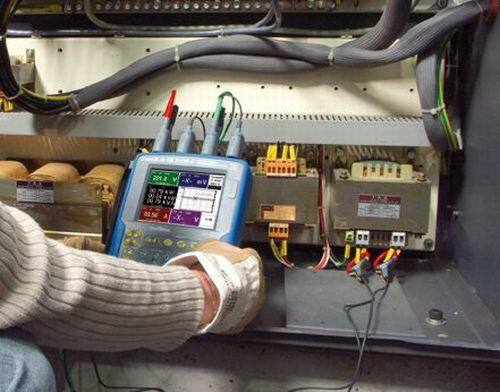 Our technicians and engineers will gladly advise you on all oscilloscopes and all products in the field of regulation and control, measuring instruments and scales. 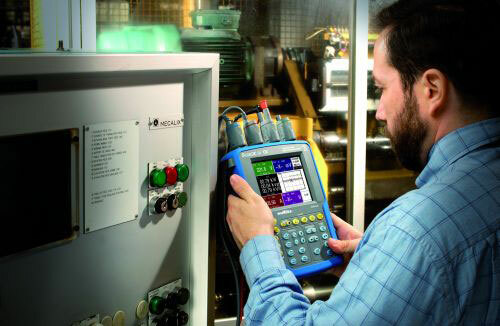 Here you can find an overview of further oscilloscopes for industry and research. scale and unit of measurement, automatic or cursor measurements, error detection with date/time, zoom, etc. 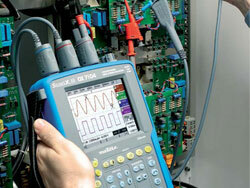 Besides the portable oscilloscope you can also find portable laboratory oscilloscopes.